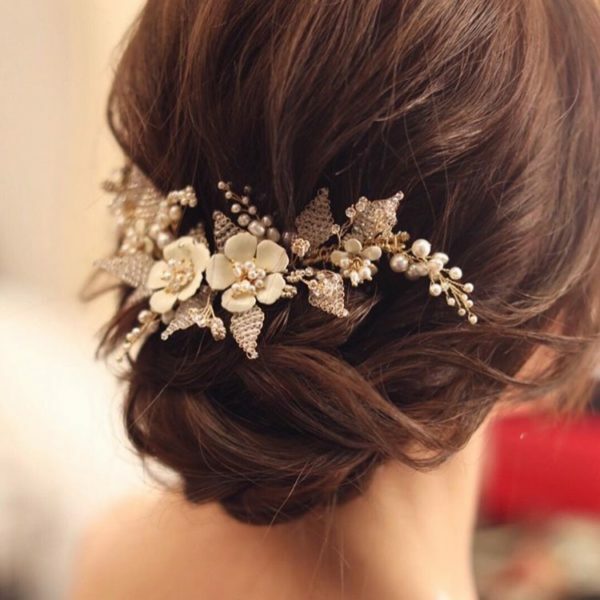 There’s something utterly romantic about the Jasmine wedding hair comb. It could be its sweet flurry of hand-woven crystal leaves peeking out from beneath a scattering of pearl clusters and enamel flower details. Or, it could be the way it perfectly frames your locks from behind as you walk down the aisle. Either way, we know we absolutely adore this charming piece that adds the perfect hint of luxurious feminine appeal to any bridal look. Featuring our signature fine beaded details and our love for the feminine aesthetic, the Jasmine headpiece is something you will love to have and hold. *LIMITED QUANTITIES – Due to the popularity of the Jasmine headpiece, we have limited materials available to create this design. If you love this headpiece, we recommend you secure it before we are no longer able to recreate it. 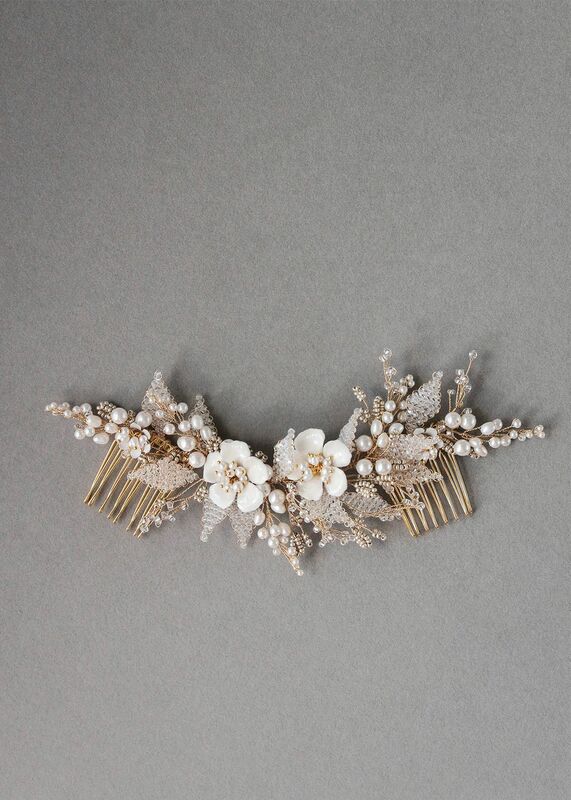 The Jasmine wedding hair comb is made to order. Please allow 3-4 weeks for production plus delivery times. A piece designed for the quintessential updo and romantic half up hairstyles, the Jasmine headpiece was made for modern romantics and style-focused brides. The Jasmine comb is a flexible and versatile design that can be manipulated to the shape of your bridal hairstyle or hair bun. Wear it in a half up/half down hairstyle to frame a veil’s comb, or position it above a bun for a classic and sophisticated look that’s feminine on all levels. If you’re envisaging a high set bun, the Jasmine can be curved to frame the bun beautifully and set on top of a wedding veil. The Jasmine comb was designed to be worn with a veil – the metal combs are positioned at the ends of the headpiece which creates the perfect space for the veil’s comb to slip in between. For a seamless and effortless finish, we adore the Jasmine comb styled with a long chapel or cathedral length veil. 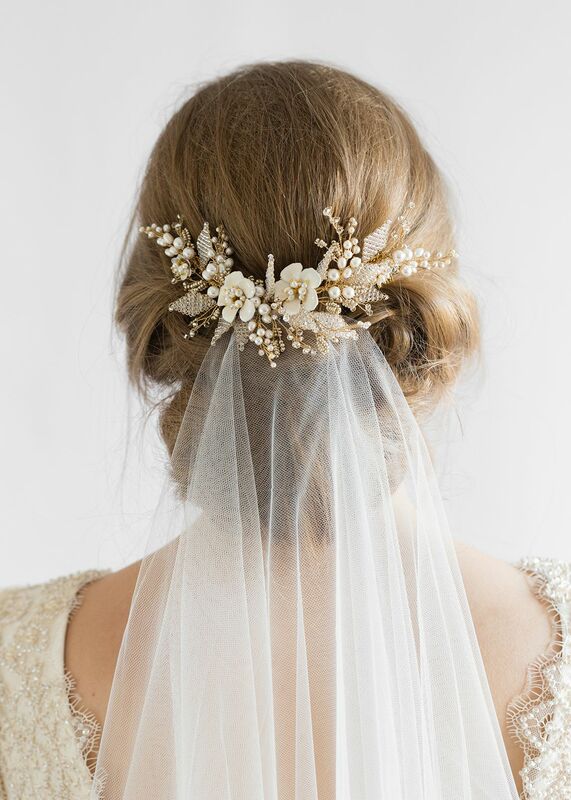 Our favourite veils to pair with this headpiece include the Rosella chapel length veil or the Blair fingertip veil if you love a slightly shorter look. Browse our full veil collection or contact us and we’d be happy to offer a recommendation to suit the Jasmine based on your wedding dress and hairstyle. The details may be reworked with other details found in the collection, for example, addition of smaller clay flowers instead.